It looks like it’s going to be spooky in Saskatchewan for Halloween 2018. We ran an OnTopic survey with 800 people from all over Saskatchewan on our online panel, SaskWatch Research®, earlier this month to find out how Saskatchewan residents plan to spend their Halloween in 2018 – and we found out that more than half of Saskatchewan residents (59%) plan to celebrate the spookiest holiday this year. This is less than the 66% who planned to celebrate Halloween in 2017. 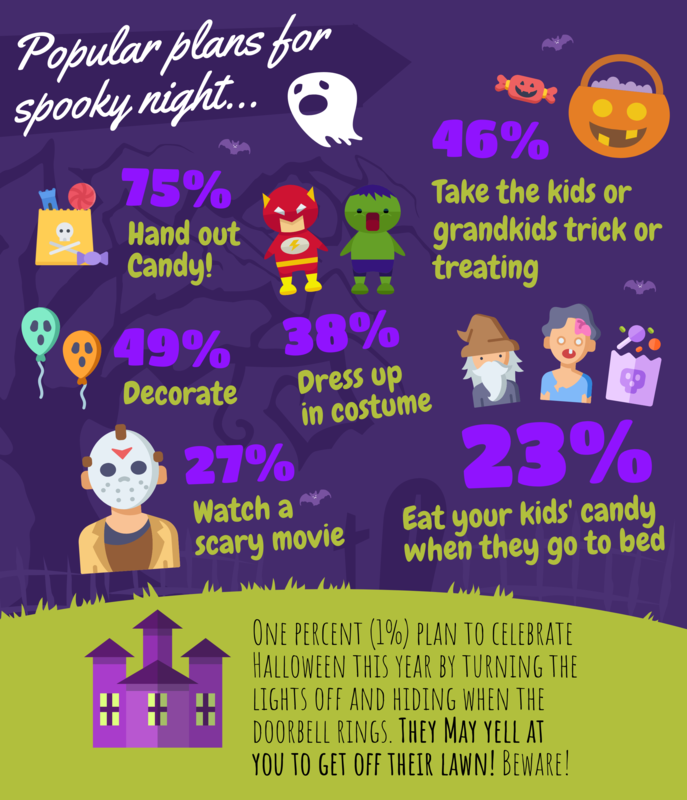 We also found out that about the same amount of men (60%) and women (58%) plan to celebrate Halloween in 2018, and that more folks with more than one kid in their household (77%) plan to get in on the fun than those without any children (48%). Saskatchewan residents of Indigenous ancestry (70%) are also more likely to plan to get in on the Halloween festivities. What will they get up to for Halloween 2018? When we asked Sask. residents who said they planned on celebrating Halloween 2018, we got a whole range of responses. According to our survey, it looks like Saskatchewan residents are planning a traditional Halloween this year. The top responses we received were: hand out candy (75%), decorate (49%), take the kids/grandkids trick or treating (46%), dress up in a costume (38%), watch a scary movie/TV show at home (27%), eat the kids’ candy once they’ve gone to bed (23%), go to a haunted house (15%) and dress up the family pet in a costume (12%). Is it possible to be a Halloween Grinch? Maybe – as 1% of residents who plan on celebrating Halloween also plan to turn off the lights and hide when the doorbell rings. 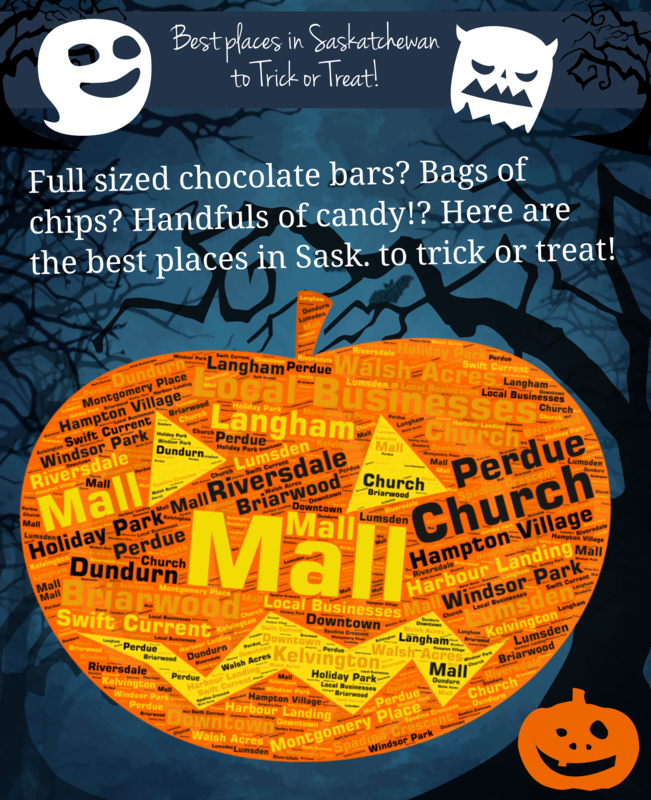 Where will Saskatchewan trick or treat this Halloween? Saskatchewan residents have a whole lot of choices when it comes to where they plan to trick or treat this October 31. 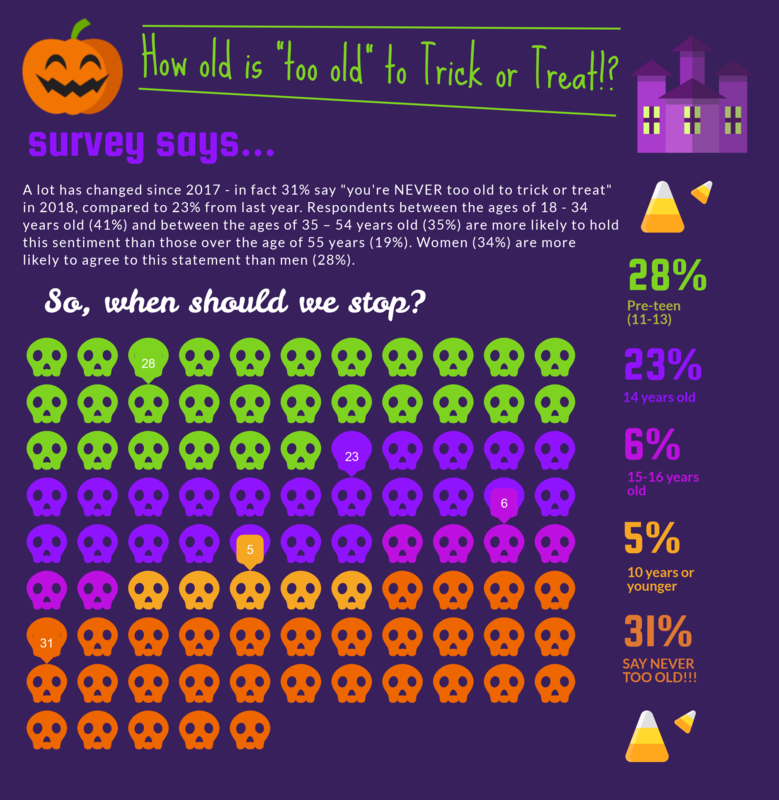 Of the folks who stated they were planning to take the kids or grandkids trick or treating, 38% said they plan to stick to their local neighbourhood/close to home, 17% said an unspecific neighbourhood, 14% stated they plan to trick or treat at friends’/families’ houses, 10% had a specific neighbourhood in mind and almost one in ten (9%) said they plan to hit up malls/businesses for their candy. Stop trick or treating? At what age? We asked everyone who completed our survey what age they thought it was appropriate to hang up the pillow case for good and stop trick or treating. What we found out was that almost one third (31%) of Sask. residents think that you are never too old to trick or treat. Respondents between 18 – 34 years old (41%) and between 35 – 54 years old (35%) are more likely to hold this view than those over the age of 55 years (19%). Also, women (34%) are more likely to agree to the statement than men (28%). Of those who thought that trick or treating should have some age limit placed upon it, 28% believe that pre-teen (11 – 13 years old) is the age to give up the candy hunt. Grandma and Grampa agree – 36% of those over the age of 55 years think pre-teen is the right age to give up trick or treating. Lots of Halloween fun on the way for Saskatchewan! It turns out that many Saskatchewan residents are planning on getting in on the fun this Halloween. And many of those planning to celebrate Halloween have a range of plans for activities. Trick or treating remains a relatively popular activity, judging by the number of residents planning to hand out candy this year and take the kids or grandkids trick or treating – and the places they plan to go to get that candy are quite varied. What are you getting up to for Halloween 2018? Let us know through our SaskWatch Facebook account or on our Instagram account. We’d love to hear your plans! Insightrix began developing its SaskWatch Research® online market research panel in 2007. Presently, there are over 18,000 active panel members, representing all regions of the province and distributions of the general population. Panel membership closely matches the 2016 Census, based on age, gender, household composition, household income and education. Omnibus research is a quick and cost-effective effective research tool that doesn’t break the bank. Our monthly omnibus sample is random and representative: we set quotas by region, age and gender to ensure the sample matches the distribution of the population. We provide guidance on question wording and ensure the results from your questions remain confidential and available only to you.